FILE - A staff member stands in front of a Huawei shop in Beijing, China, March 7, 2019. VOA's Xu Ning contributed to this report. 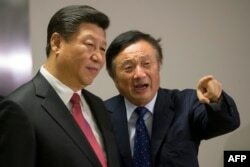 FILE - Chinese President Xi Jinping, left, is shown around the offices of Chinese tech firm Huawei technologies by its President Ren Zhengfei in London during his state visit, Oct. 21, 2015. It is the Meng case that President Trump has suggested he might use as leverage in ongoing trade talks. Speaking to reporters at the White House last month, he said, “We’re going to be discussing all of that during the course of the next couple of weeks. We’ll be talking to the U.S. attorneys. We’ll be talking to the attorney general. We’ll be making that decision. Right now, it’s not something we’ve discussed." This seems to be reflected in recent reports that U.S. allies, in Europe, India, the United Arab Emirates and elsewhere, are showing real resistance to U.S, demands. A report in the New York Times late Sunday said that in Europe, the general sense is that any risk posed by Huawei is manageable through monitoring and selective use of the company's products. The story noted that German Chancellor Angela Merkel's response to the U.S. was a terse message that Germans would be "defining our standards for ourselves."